A University of Southampton archaeologist and Oxford Archaeology have found evidence that Neanderthals were living in Britain at the start of the last ice age, 40,000 years earlier than previously thought. Commissioned by Oxford Archaeology, the University’s Dr Francis Wenban-Smith discovered two ancient flint hand tools at the M25 / A2 road junction at Dartford in Kent, during an excavation funded by the Highways Agency. Tests on sediment burying the flints show they date from around 100, 000 years ago, proving Neanderthals were living in Britain at this time. The country was previously assumed to have been uninhabited during this period. “I couldn’t believe my eyes when I received the test results. 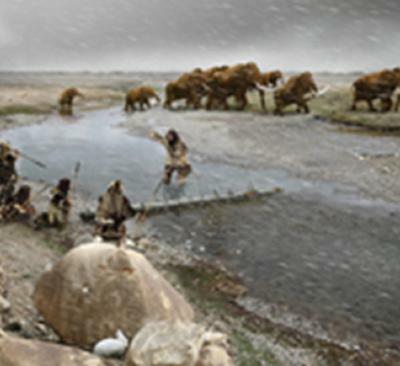 We know that Neanderthals inhabited Northern France at this time, but this new evidence suggests that as soon as sea levels dropped, and a ‘land bridge’ appeared across the English Channel, they made the journey by foot to Kent,” says Francis. Early pre-Neanderthals inhabited Britain before the last ice age, but were forced south by a previous glaciation about 200, 000 year ago. When the climate warmed up again between 130,000 and 110,000 years ago, they couldn't get back because, similar to today, the Channel sea-level was raised, blocking their path. This discovery shows they returned to our shores much earlier than 60, 000 years ago, as previous evidence suggested. “The fieldwork uncovered a significant amount of activity at the Dartford site in the Bronze Age and Roman periods, but it is deeper trenches excavated through much older sediments which have yielded the most interesting results – shedding light on a long period when there was assumed to have been an absence of early man from Britain,” comments Oxford Archaeology Project Manager David Score. One theory is that Neanderthals may have been attracted back to Kent by the flint-rich chalk downs visible from France. These supported herds of mammoth, rhino, horse and deer – an important source of food in sub-arctic conditions. “These are people who had no real shelter – no houses, not even caves, so we can only speculate that by the time they returned, they had developed physiologically to cope with the cold, as well as developing behavioural strategies such as planning winter stores and making good use of fire,” says Dr Francis Wenban-Smith. The last glacial period (or ice age) occurred between around 110, 000 to 10, 000 years ago, but this was interspersed with fluctuations when the climate temporarily warmed. It is unclear whether Neanderthal colonisation across North Western Europe and Britain was related to these minor fluctuations. Dr Wenban-Smith believes more evidence is needed to date their occupations more accurately, to show how many were living in Kent at this time, how far they roamed into Britain and how long they stayed for. The Channel is also a critical area for further research, with the buried landscape between Boulogne and Newhaven — provisionally christened "Boulognia" — possibly containing the crucial evidence. The excavation was carried out prior to construction work on the scheme by the Costain Group PLC. The archaeological investigations were designed by Jacobs Engineering U.K. Ltd, in consultation with Kent County Council. Other results from the project include the discovery of a woolly rhino tooth in the floodplain gravels of the River Darent, dated at around 40,000 years old. The flints are waste flakes from the manufacture of unknown tools, which would almost certainly have mostly been used for cutting up dead animals.